Windows 10 is going to be the last major revision of the operating system. Jerry Nixon, a Microsoft development executive, said in a conference speech this week that Windows 10 would be the "last version" of the dominant desktop software. 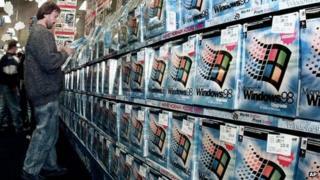 His comments were echoed by Microsoft which said it would update Windows in future in an "ongoing manner". Instead of new stand-alone versions, Windows 10 would be improved in regular instalments, the firm said. Mr Nixon made his comments during Microsoft's Ignite conference held in Chicago this week. In a statement, Microsoft said Mr Nixon's comments reflected a change in the way that it made its software. "Windows will be delivered as a service bringing new innovations and updates in an ongoing manner," it said, adding that it expected there to be a "long future" for Windows. The company said it had yet to decide on what to call the operating system beyond Windows 10. "There will be no Windows 11," warned Steve Kleynhans, a research vice-president at analyst firm Gartner who monitors Microsoft. He said Microsoft had in the past deliberately avoided using the name "Windows 9" and instead chose Windows 10 as a way to signify a break with a past which involved successive stand-alone versions of the operating system. However, he said, working in that way had created many problems for Microsoft and its customers. "Every three years or so Microsoft would sit down and create 'the next great OS'," he said. "The developers would be locked away and out would pop a product based on what the world wanted three years ago." Microsoft also had to spend a huge amount of money and marketing muscle to convince people that they needed this new version, and that it was better than anything that had come before, he explained. Moving to a situation in which Windows is a constantly updated service will break out of this cycle, and let Microsoft tinker more with the software to test new features and see how customers like them, he added. Most of the revenue generated by Windows for Microsoft came from sales of new PCs and this was unlikely to be affected by the change, Mr Kleynhans pointed out. "Overall this is a positive step, but it does have some risks," he said. "Microsoft will have to work hard to keep generating updates and new features, he said, adding that questions still remained about how corporate customers would adapt to the change and how Microsoft would provide support. "It doesn't mean that Windows is frozen and will never move forward again," Mr Kleynhans told the BBC. "Indeed we are about to see the opposite, with the speed of Windows updates shifting into high gear."